Apple is one of the first baby foods suggested universally. An apple a day definitely keeps the doctor away and it is really a good habit to have an apple a day as such. Carrot is one of the highly recommended first foods for babies. They are the best sources of beta-carotene, and it turns into Vitamin A helping in vision development. The phytochemicals build a good immune system and the high fibre content helps in bowel movements. 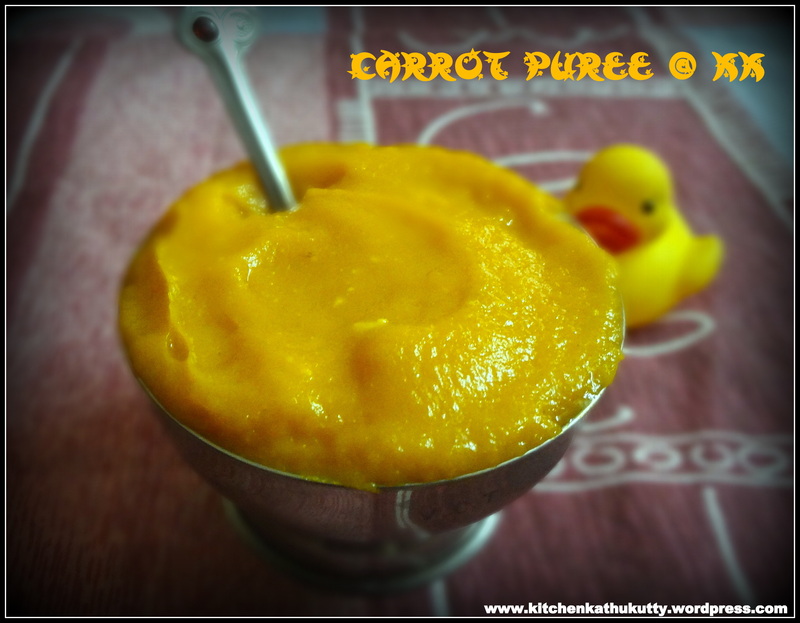 Check out my other recipes with the carrot: Carrot Halwa, Carrot Kheer, ABC Puree, ABC Juice, Ragi Carrot Halwa, Carrot Bath. 1.Wash carrot well and peel skin. 2.Chop the end and cut into 4 pieces. 3.In a pressure cooker,add 1/2 cup of water to the bottom and place the carrot in a vessel in the cooker or use a idly pot to steam cook. 4.When they turn soft,use a mixer to blend into a smooth puree. 5. Feed immediately using a sterilised spoon and bowl. Always have a word with your doctor before introducing any new food to baby. This can be given for babies above 6 months. When baby completes seven months switch to mashed carrot and when baby eight months offer carrot as finger foods. Avocado-This fruit is now very commonly found everywhere though it is mainly cultivated in the U.S.A. When I was hunting on the health benefits of this fruit,few commented that avocado is absolutely nutritious but since most of them are being imported from foreign countries they might have been loaded with preservatives. Hence I have always given a second thought to include this fruit in my baby meal and in my blog. There can a solution to this,when I visited Kodai recently. I came to know that butter fruit is also like avocado and it is cultivated in our own lands and also there are few Indian land areas which cultivate Avocado. I was happy hearing this. The shop keepers said that butter fruit and avocado are same and I too found the same from few resources. When I first tasted it,I literally cursed it for the bland taste. Any baby will not accept such a food. I am always against adding sweetner to fruits,but this fruit definitely needs some additional ingredient. I am writing in detail about how to choose avacado,how to know the right stage of ripened avocado,health benefits and avocado for babies. Hope you find it beneficial. I have used butter fruit in the below recipe. Do let me know if butter fruit and avocado are not the same fruit. 1.Wash avacado or butter fruit well. 3.You can remove the round seed and scoop the pulp. 4.Add to a blender along with palm sugar/banana and give a quick run. I used a spoon to scoop the pulp out. If your baby is above 7 months, just mash the pulp with your fingers and offer. 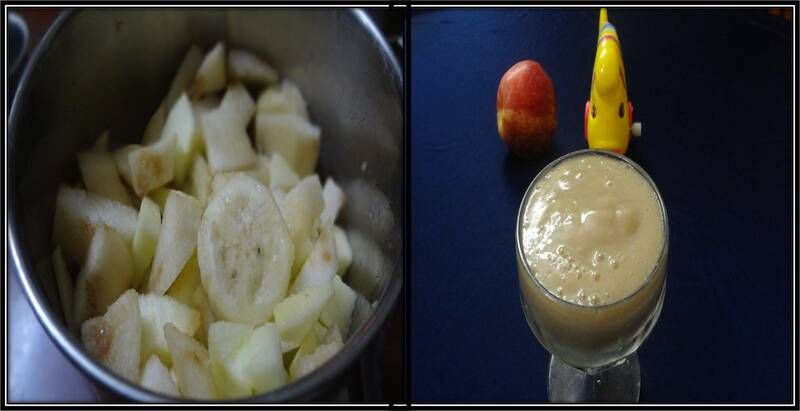 I shall soon post recipe of butter fruit smoothie for elder babies. Do consider your family history of allergies. Always sterlise bowls and spoons you use for baby. 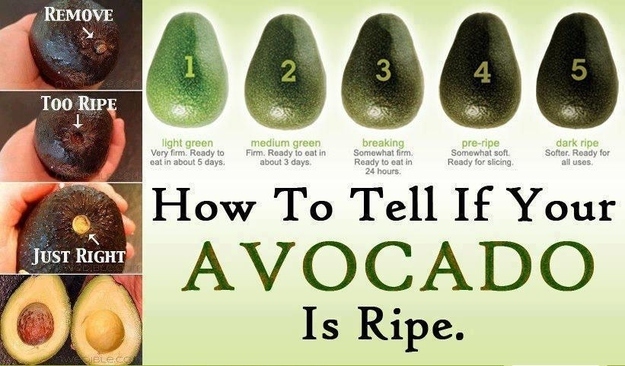 Use only ripe avocado/butter fruit. Do taste before feeding baby. 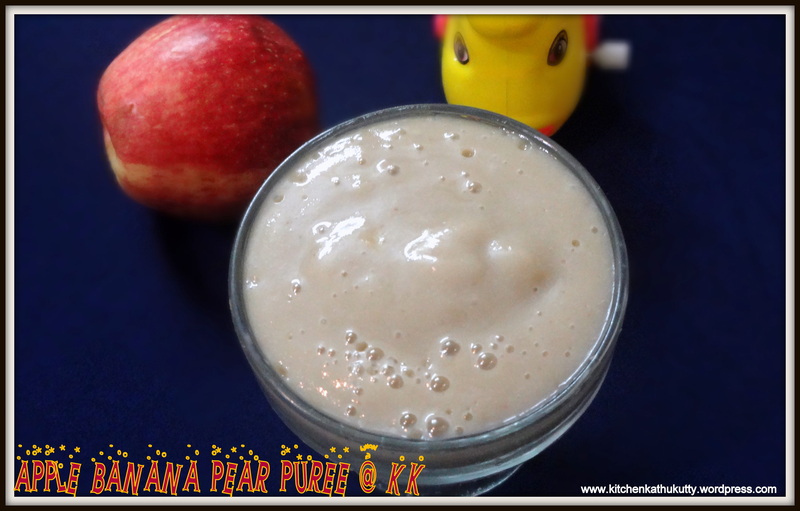 Introduce banana in prior if you are using banana in this recipe. Avocado/Butter fruit is an excellent first food for babies because of two reasons according to me. There are extremely soft and mushy and loaded with rich nutrients. it has good fat which helps in baby’s brain development and physical development. This fat is monosaturated and it is highly essential fat(rich in Omega 3 fatty acids) which helps in lowering LDL. Please disregard if someone says avocado has fat,so please avoid for babies. These are essential; good fats and they are a must. 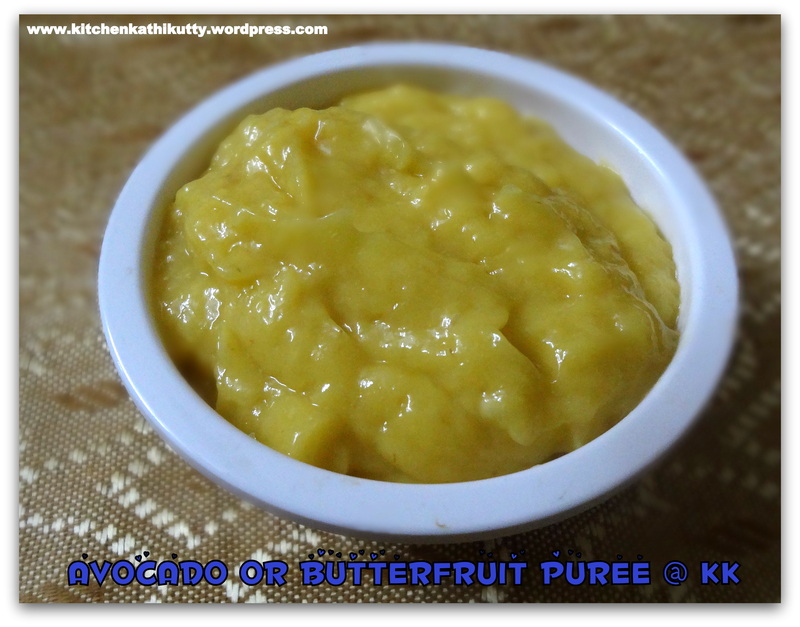 You need not cook avocado.Avocado can be given after 6 months in the form of purees. From seventh months offer them mashed and from eighth month offer them as pieces. Avocado is associated with latex allergy.Hence do consider family history of allergies. Avocado is a rich source of Vitamin C,A,E,K,B-6,niacin,thiamin and and minerals like iron,potassium,magnesium,calcium. This aids in over all development of baby. As stated earlier they have plenty of unsaturated fats which help in brain growth and vision development. it is easy to digest and helps in curing digestive tract infections. It helps in healing wounds faster,controls inflammation and enhances skin health. It is also rich folate and helps as an anti depressant. Avocados have more potassium when compared to bananas and contain 4 times higher fiber than apple. Butter fruits have a rich concentration of protein and essential amino acids than any other tropical fruit. 2.Split it into two halves and remove the seeds and the stem like part. 3.Scoop the flesh out and add to a blender. 5.Serve your baby immediately in a clean and sterlised bowl and spoon. Always have a word with your doctor before giving a new food. Sapota skin need not be removed for elders. The latex might be present in the fruit when had as such. Apply coconut oil instantly to remove and wash it. You can also just mash the flesh with your fingers instead of a blender. 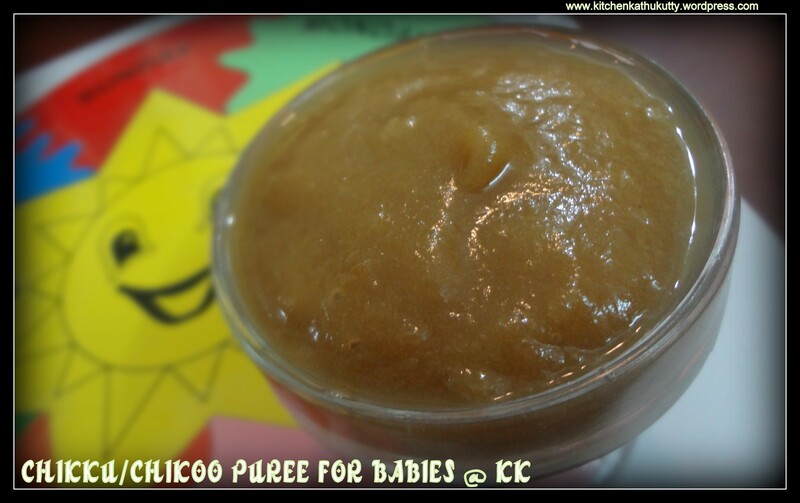 Choose the ripe chikoo as unripe one will be hard for babies to digest. When you press the fruit hard,the ripe fruit will get crushed. The flesh has to be soft and that is the right stage for consumption. Do not opt for over ripe fruits as the liquid will be oozing out. Always open up the fruit ,look for goodness ,de- seed and then consume. Over ripe fruit might have worms inside. Unripe fruits might cause stomach pain. A power house of vitamins which has Vitamins A,B,C and helps in physical and mental growth,develops eye sight,improves immunity system,aids in brain development,metabolism of lipids,hemoglobin production. Sapota is loaded with minerals like calcium, iron, magnesium, phosphorous, potassium, copper, selenium, zinc and anti oxidants. Unripe sapodila acts as a cure for dysentery whereas ripe chikku helps in curing constipation. 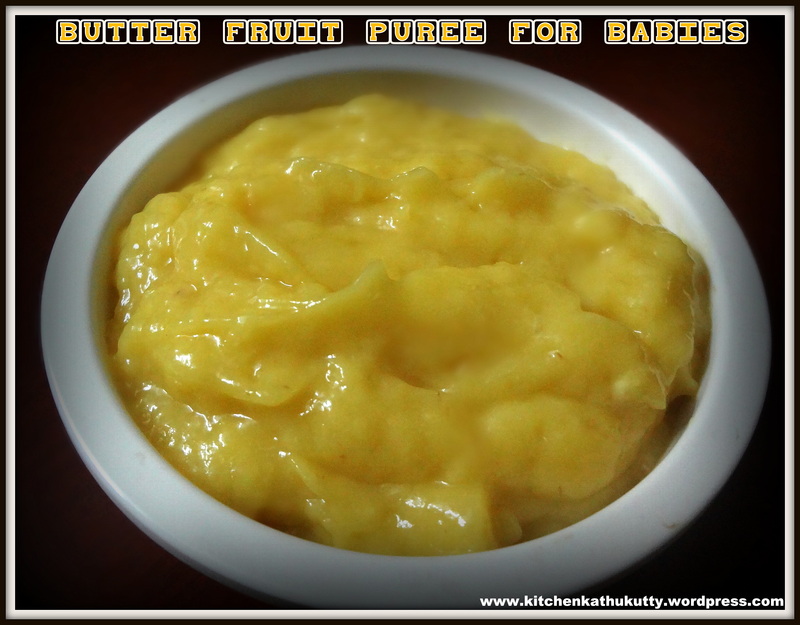 The fruit is so amazing that it can used even when your baby has congestion and cold. it is rich in its expectorant properties and hence aids it expelling mucous,phlegm and relieves from congestion. The dietary fibre present protects against colon cancer and diuretic properties prevent from kidney associated diseases. How did you like my ABC smoothie? 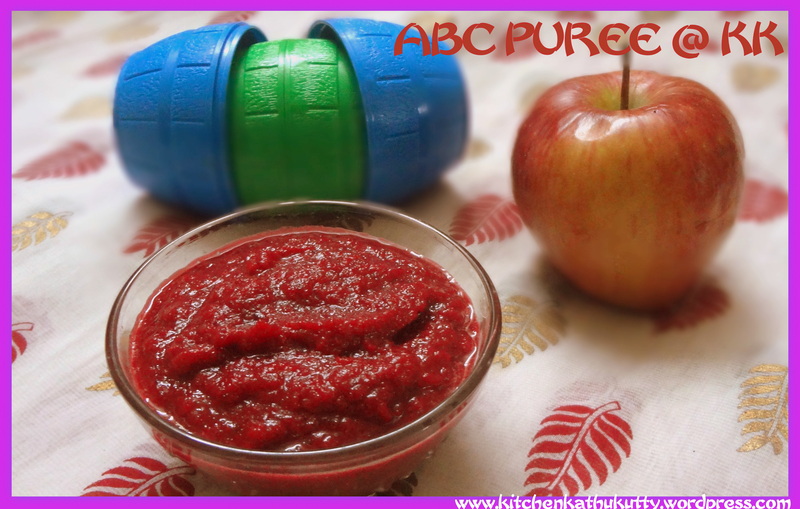 I do make ABC juice,ABC soups often,hence gave a thought about ABC puree for babies. I shall soon post ABC juice and soups which I learnt from few friends. 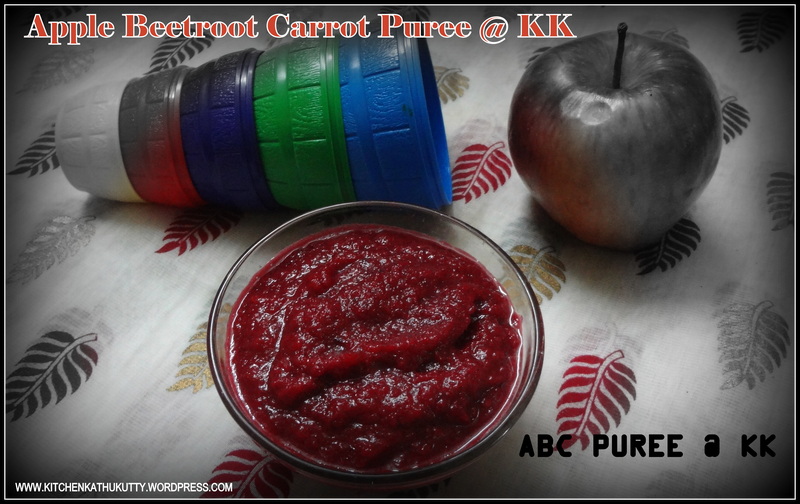 This is ideal for babies above 6 months after having tried apple,beet root and carrot individually. I am not for purees for babies. I feel babies can have mashed foods from 6 months at the worst by 8 months. And too many purees spoil them and they mix textures. 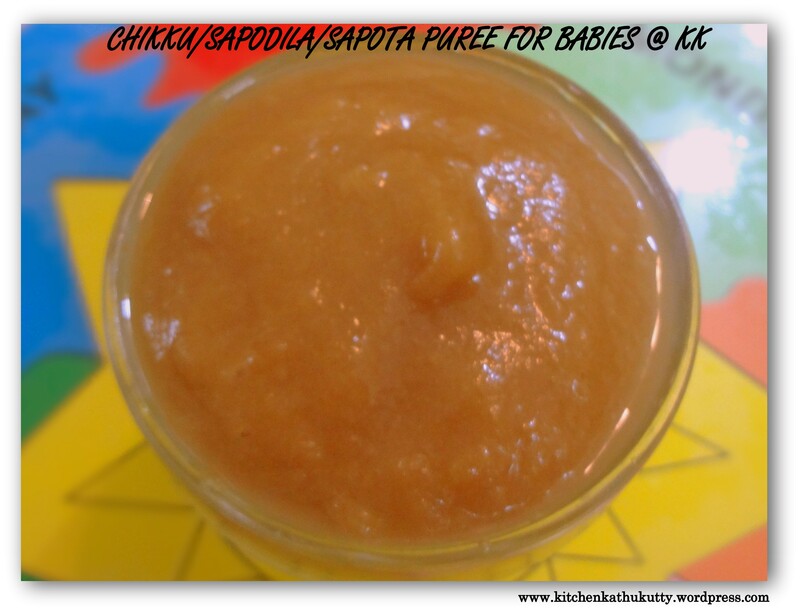 This is the reason behind not having given many puree recipes in baby food although I found mommies too keen on puree recipes. ABC juice is a miracle drink and it recommended for cancer cure,heart diseases and perfect complexion. It supplements brain functioning and lung functioning. The combination of apple ,beet and carrot gives a long term health . The power of two vegetables and one fruit is like a super power. It gives you Vitamin A, B1, B2, B6,B3 C, E ,K, Folate, Niacin, Zinc, Copper, Magnesium, Potassium, Phosphorus, Iron, Calcium, Sodium, Potassium, Magnesium, Selenium, beta-carotene and Manganese. No storing of this combo.Consume immediately after making. I make it with raw fruit and veggies. But here I suggest you to steam vegetables as it is for 6 m baby. 2.Peel the skin of beet and carrot. 3.Grate them and steam cook. 4.When you are about to add everything to blender peel apple and grate. Always consult your pediatrician before trying any new food. Prefer this for afternoon time. You can also just mash these together and offer your baby if you don’t prefer blending baby food(I hardly use blender for my baby). Consider family history of allergy. Use sterilzed bowls for baby. I recommend you to go for puree with steamed veggies for 6 months old,move to mashed (steamed veggies) for 7 months to 9 months ,move to just mixing grated and steamed ingredients for 10 months and above one year just give it raw. This is just a suggestion. The quantity and ratio depends on your taste.